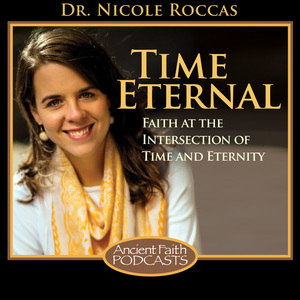 Last week, I relaunched the Time Eternal podcast with a new format and feel (see what I mean by listening to the first episode, entitled “Sites of Eternity”). One of my inspirations for “Sites of Eternity” was Krista Tippett’s interview with Catholic theologian Fr. Richard Rohr. 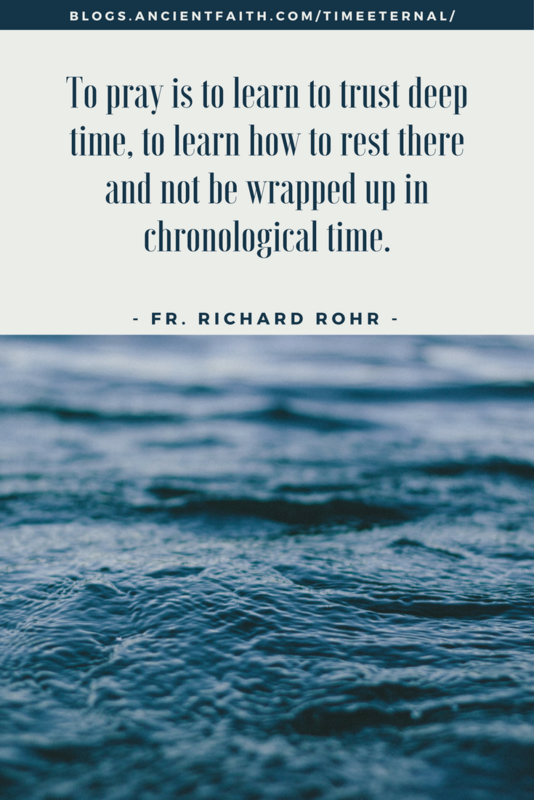 At the beginning of the conversation, Tippett and Rohr are talking about the difference between chronos and kairos, the two modes of time one encounters in the Bible. I grew up around water. We lived one block away from the largest lake in Wisconsin and also had a deep swimming pool in our backyard. Throughout my childhood, I spent so much of my time in the water my dad once told me I was part fish–and I believed him. But there was one thing about the water that terrified me: swimming somewhere too deep to see the bottom. I can still recall the many times I’d drift in my innertube past the shallow waves and sandy bottom of the lake’s shore. With alarming suddenness, the water would fade from rich hazel to endless, inky black. My feet dangling below could feel an icy chill emanating up from the murky depths. And I’d linger, willing myself not to be afraid, not to think about what might be down there. But inevitably, something–a tickle of seaweed against my toes, the apparent glimmer of something swimming past–would send me back to shore in a torrent of frantic strokes. Just as my childhood self sought to muster her deep-water courage, we try to stay in that moment, that Presence. But something–a flutter of shame, a wave of selfishness, the biddings of distraction–incites us to retreat, fumbling and dissipating our way back to the shallower currents of thoughts and cares. Years go by. In Cuba, on my honeymoon, I went snorkeling for the first time in my life. Although it had been years since I swam in the lake of my youth, I once again found myself engulfed by the same inky shadow of dark waters, the same desire to swim away. But as soon as I peaked below the surface, I beheld a world of untold submerged beauty. Far below me, fish bustled by in their schools, fingers of coral reached upward, and turquoise sea kelp swayed in the wisps of sunlight. 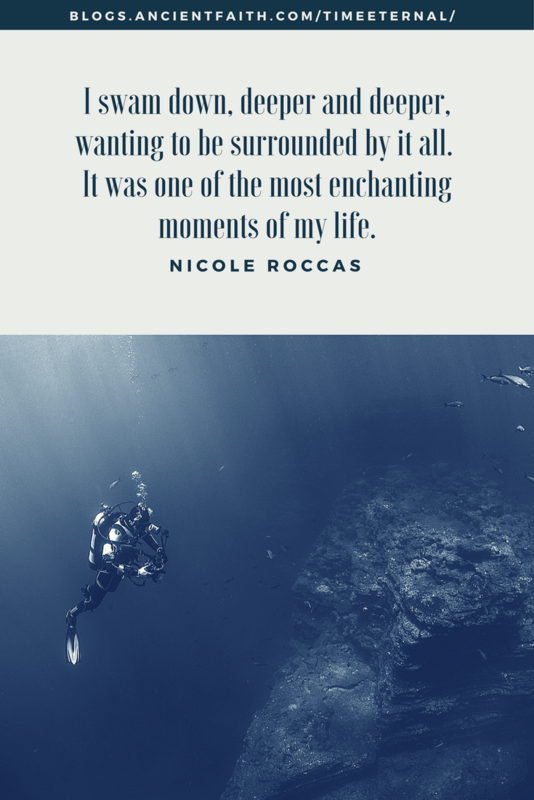 Captivated, I swam down, deeper and deeper, wanting to be surrounded by it all. I swam so far underwater that my ears and lungs began to burn, yet everything remained out of reach, too deep to grasp. For perhaps the first time, I was sad to observe the depths from a distance. It was one of the most enchanting moments of my life. 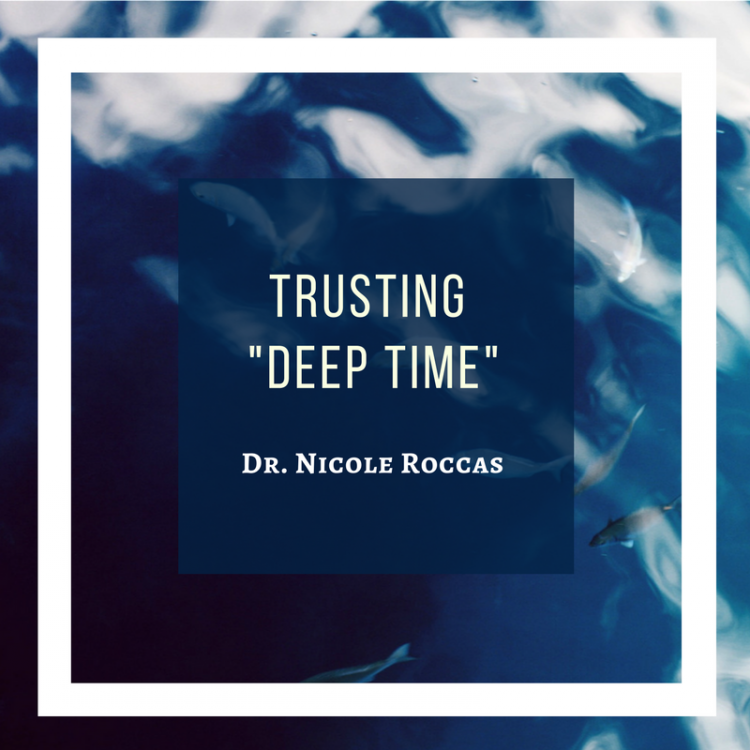 I wonder if that is a taste of what we miss when we flee the depths of prayer: untold beauty, life, stretching up to us from below the surface of our cares and reticence. I don’t know, but I hope someday I can find out. I hope someday, I and my little innertube of a soul have the courage to remain in–and trust–deep time. We sleep to time’s hurdy-gurdy; we wake, if ever we wake, to the silence of God.